Presentation of the new book by Ricard Garcia “Reading book”, at the Vallpalou Foundation. The presentation will take place on Friday May 4 2012. This is the first event in a series that I call Between dizziness helix, and will be devoted to the world of books and poetry and framed in the context of the exhibition currently (until June 23) can be seen at the Vallpalou Foundation: echo by Tom Carr. ​The master of ceremonies will be Josep Anton Lafuerza, professor of philosophy, poetry reader and connoisseur of the work of Garcia. 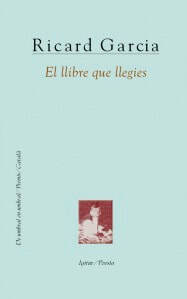 Then Ricard Garcia (Sant Llorenç d’Hortons, 1962) will read some of the poems that make up the book of poems.